Now onto the storm. Several days ago, weather forecasting models such as the GFS and Euro showed a giant snowstorm for the area, which if happened, would produce near blizzard conditions across the Interstate 95 corridor and heavy snowfall. However, since then, there has been a change in the forecast, and the weather models began trending further north and west with the location of this storm. Now, most of the models have trended far west enough with this storm that coastal locations would see mainly rain from the solutions that the models have. This westward trend is typical with storms that are in the long range, as so far this winter, most of the storms that have affected us were shown to be further east than they actually were about a week prior to the storm affecting the region. This storm proved to be no different. The latest run of the NAM (12z run) had a completely different scenario and took this storm out to sea, which proves that there is still a great deal of uncertainty and that we will have to wait until at least late Tuesday/Wednesday before we have a better idea of what happens, which is why this is only a generally low confidence preliminary discussion/map. 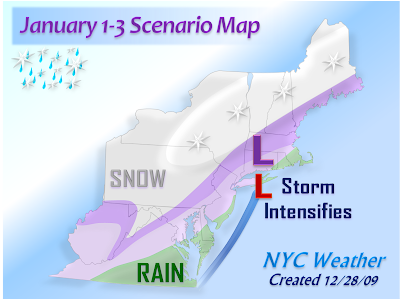 Remember that this is only a preliminary scenario map, there are still a few days until this storm reaches the area, and things can still change. Do not consider this as the final solution. We will first see a coastal low moving north northeast from the eastern part of North Carolina, staying close to the coast. However, we are not looking at the cold air to immediately take over, as there will be a weak low pressure area in the Great Lakes that will prevent that from happening at first. As a result, the coastal low will start out mainly warm, with rain starting from the coast and reaching as far west as up to 50 miles west west of the I-95 corridor. Areas further west than that will start out with a snow or a wintry mix. The storm is then expected to rapidly intensify, and then slow down or nearly stall. By this time, which should be later on Friday, the storm will be able to draw in cold air, with the rain/snow line moving further east. The question is, where will the storm slow down and/or stall, as it is very important in finding out how much snow we get. I am thinking at this time that it happens in western Massachusetts, which combined with the entering cold, would mean that the area will then change over to snow. However, we would not see a significant snowfall, but rather a lighter snowfall, with a wintry mix possible for western Long Island and eastern Long Island staying all rain. The storm will then begin to weaken, with precipitation ending on Saturday. 1. The storm manages to phase and intensify earlier, resulting in a brief rain to a prolonged snow event for the area. 2. The storm continues to trend west and becomes warmer, resulting in mainly rain to a mix for the area. 3. The storm trends a little more south and east, resulting in a snowier solution for the area. 4. The storm ends up intensifying too far east, resulting in scattered rain/snow showers for the area. Green zone: Mainly rain, possibly changing to light snow showers at the end for the northern half of this region (from the Jersey Shore to Cape Cod). Light Purple zone: Rain to start, changing over to wintry mix/snow. Lighter accumulations possible. Dark Purple zone: Rain or mix to start changing over to snow. Heavier snow accumulations possible. Light Gray zone: Plain snow zone with no mixing. Lighter to moderate accumulations possible. White zone: Jackpot area for snow with the storm. Heaviest snow accumulations are possible in this region.